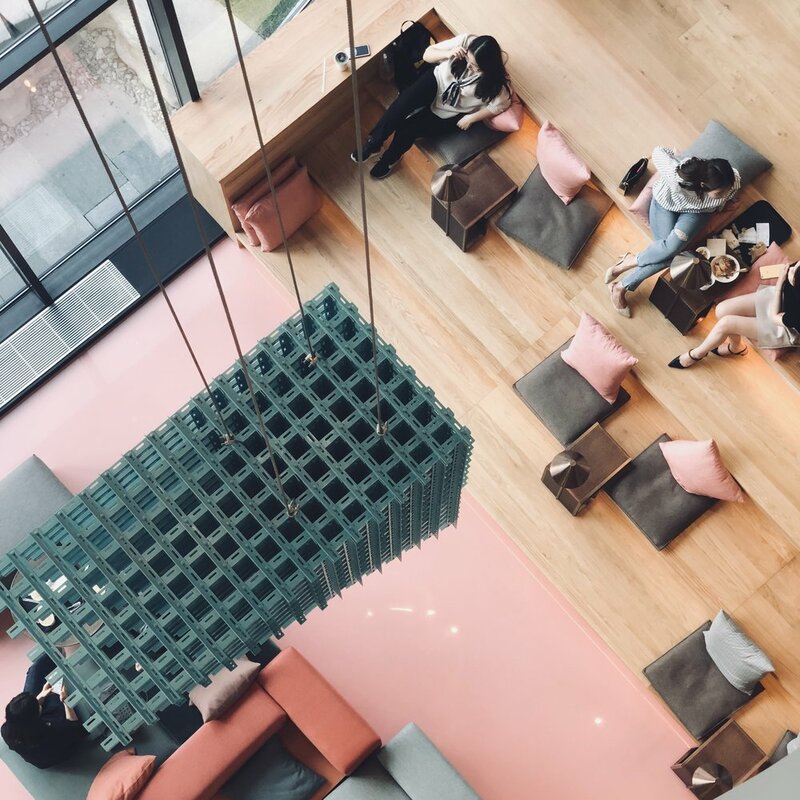 The RYSE Hotel (@ryse_hotel) in Seoul's youthfully buzzy Hongdae district, is not your run-of-the-mill Design Hotel catering to the often misunderstood Millennial business and weekend traveller, it's a different beast entirely. 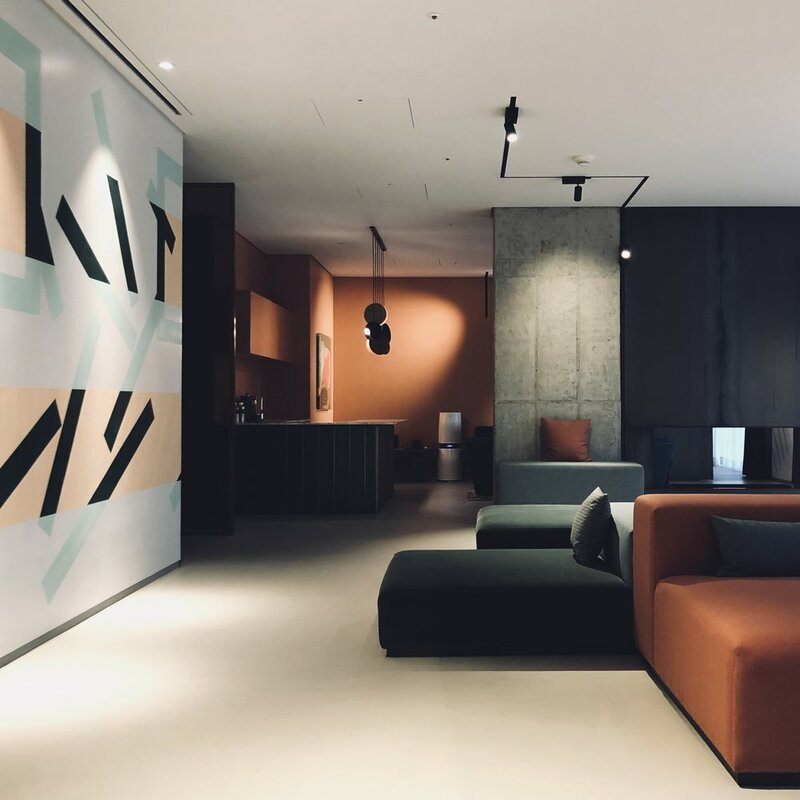 At the root of it's inception is the need for the hotel to be a flexible and adaptable entity in the intersection of Art, Street Culture, and Design- one which hopefully evolves with its neighborhood- a Ginza-esque area composed of university students and a handful of seedy underground hip-hop night clubs. At 272 rooms, all designed by the original SOHO House Designer, London's Michaelis Boyd, this is no small feat, in fact this independent hotel, a member of the Marriott Group's collection of Autograph Hotels, wants to service its base clientele of global Autograph loyalists, while also trying to push their boundaries within personal touch points. These touch points mostly refer to the hotel's unique way of displaying one-of-a-kind curated works of art in each of the public and private spaces making people ask- hopefully the right questions- "like what the hell is that? I want to know more!" My own room, dubbed the "Producer Suite", features two photographs by Hong Kong and Paris-based photographer, Laurent Segretier, and paper work by Japan-based French Artist, Charles Munka. A photography book by Wolfgang Tillmans is sat on display on top of the Living room's rainbow-rific dichroic glass topped Coffee table. Elsewhere, a signature hanging sculpture- picked from a shortlist of worthy entries- spans vertically amongst three lobby floors by Kyunghwan Kwon, bringing to the space a gridded steel statement, popping in neon hues front and center - a move that's aggressively confronting or an elegant focal point for introspective thought- a duality that's a seemingly accurate metaphor for the RYSE experience as well. I can talk about the delicious Tartine Bakery from San Francisco, on the Ground Floor, or the hot Thai street food offerings of Chef David Thompson's, Long Chim restaurant on the 3rd floor... I can even bring up the creative spaces meant to be used by artists, designers, and media makers on the 5th Level, or the excellent retro vinyl and cocktail music lounge, Side Note Club on the 15th Floor- but then I won't have any room for Photographs on this post- so I'll just wrap it up. 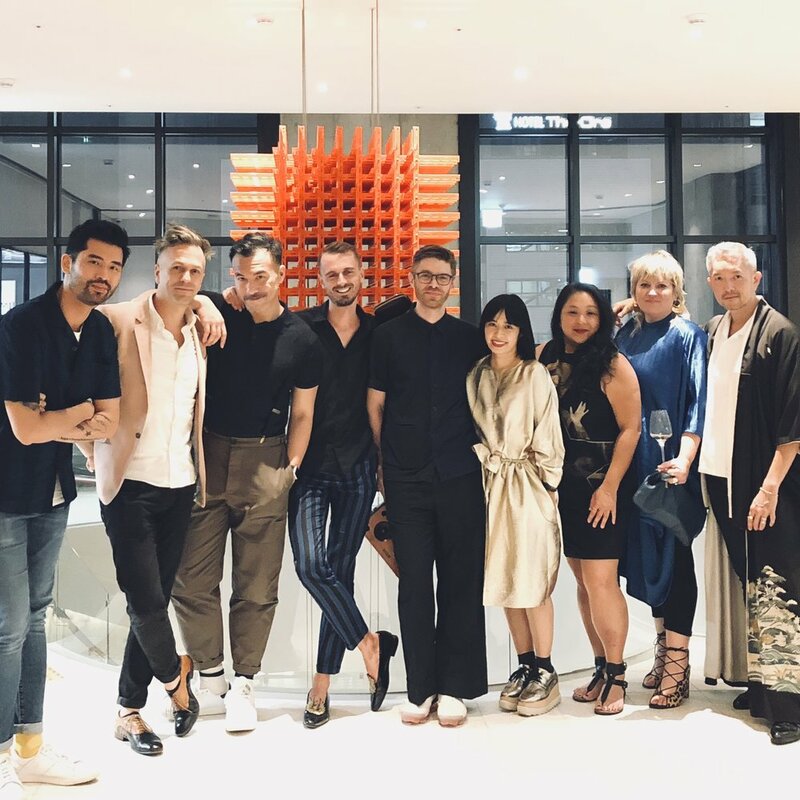 My friend, Jason Schlabach, the "Editor-in-Chief" of this project devoted about 3-4 years from branding the hotel under Marc & Chantal, to later being brought on as the in-house Creative Director of the hotel group. 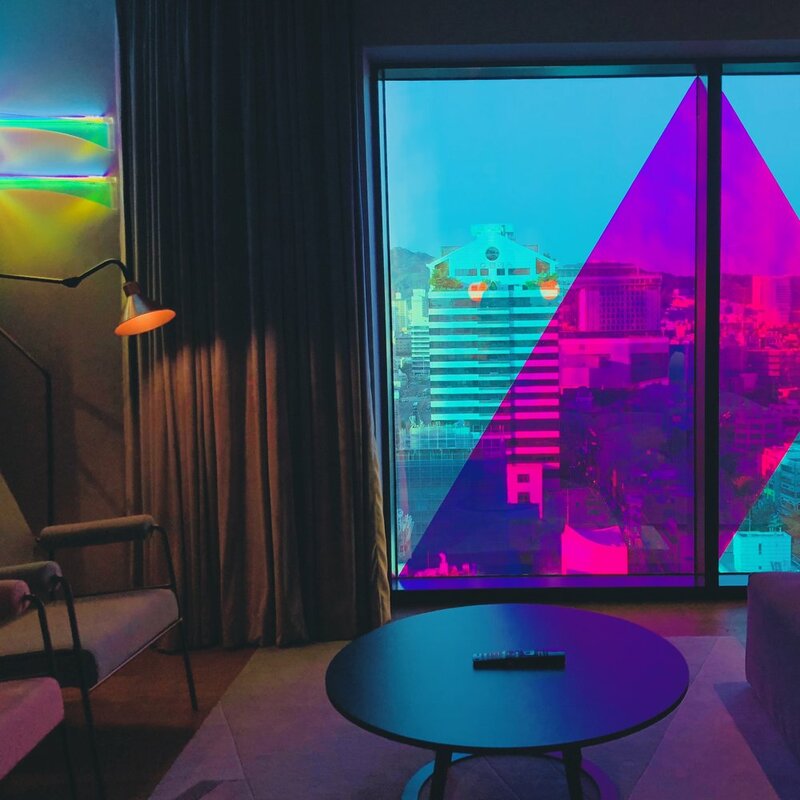 When asked by other hotel operators how he got choice artists, designers, and restaurant brands of stature to offer content for this property, his answer was pretty simple- "keep everything authentic, and continue to speak to the core creative community, this is the way we earn their trust". Needless to say all he got in return from hospitality veterans were blank stares. Mr. Jason Schlabach, "Editor-in-Chief" takes us on an official VIP tour of the space. One of the "maker studios". The "Executive Producer" EP Suite with wall art by Na Kim and Pieces by Lee Bae. Each signage on every floor is hand-crafted, Paint/Gesso combination applied uniquely for the graphic. 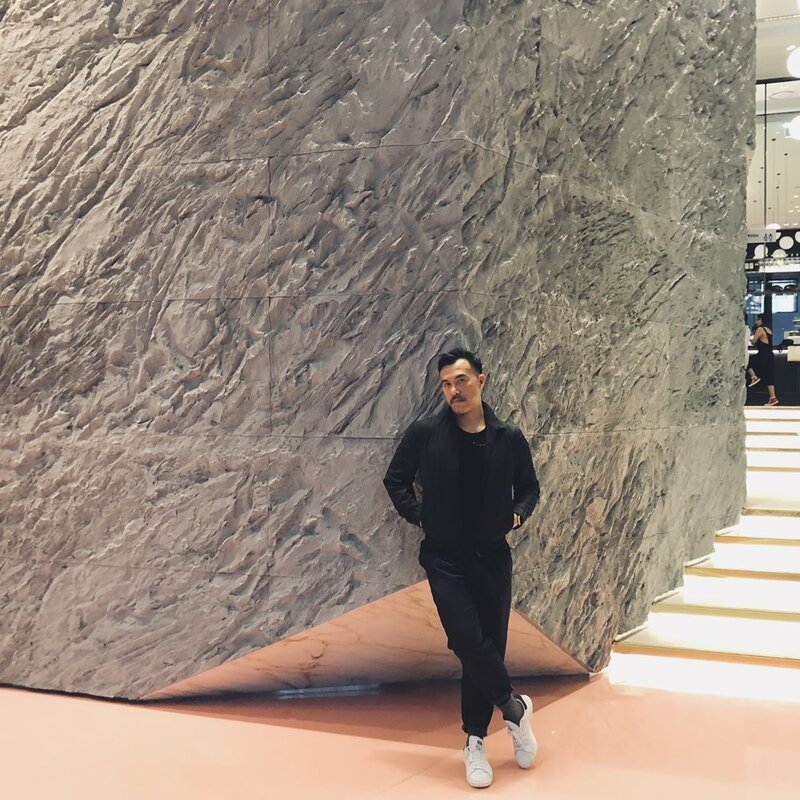 This lightweight concrete wall by Ivanka Concrete was formed using a 3D Printed mould, made to resemble a natural rocky surface on the Lobby Floor. Art Work at Tartine by Chicago-based Artist, Cody Hudson. Bespoke light feature in Long Chim. In-house posters printed via Risograph printers. Posters to be displayed in rooms and public spaces and designed in collaboration with various studios. In the bag, a take home gift for myself- RYSE bathrobes designed by Korean indie fashion label, IISE. Me at my Korean "home". This blog post solely used the Camera, Photo, and SquareSpace Apps on the iPhone X.